Far more than a simple converter, this media solution allows you to convert video and DVD, burn video to DVD, download online videos, watch online videos smoothly – movie experience greatly improved in an easier way. Convert video/DVD to video or audio in more than 180 formats for multiple purposes. Download videos from various video sharing sites like YouTube, Facebook, Vimeo, etc. Convert and burn video to DVD disc, DVD folder or ISO image files easily with large amount of DIY features available. Create 3D movies from 2D video/DVD sources in 6 different 3D effects. Acting as a video converter, Video Converter Ultimate can easily convert video (common video, HD video and online videos included) between more than 180 formats, including: AVI, MP4, WMV, FLV, RMVB, MPEG, 3GP, MKV, MP3, WMV, WAV, AAC, OGG, M4A, etc. Watch DVD movies on your DVD player! Also as a DVD converting program, Video Converter Ultimate can convert DVD to common/HD video and audio files in AVI, MP4, WMV, FLV, RMVB, MPEG, 3GP, MKV, MP3, WMV, WAV, AAC, OGG, M4A, etc. for off DVD player enjoying. 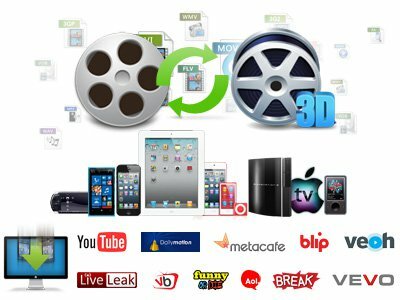 Video Converter Ultimate helps to achieve multiple purposes by converting DVD/video: editing in video editing software like iMovie, Final Cut Pro, etc., sharing on YouTube, website or blog, or even playback on iPhone 4,5,6, iphone SE, iPad, iPad 4, Lumia 920, Galaxy, HTC One, etc. Enjoy extraordinary and flexible homemade DVD creation! With excellent home DVD creation ability, this media converter suite could create home DVD discs, DVD folders or ISO Image File from videos in various formats, like MP4, MPG, WMV, 3GP, FLV, M4V, MPEG, MKV, etc. and various video sources like camera videos, online videos, etc. During DVD creation, this easy media converter, provides useful and user-friendly options, to let you customize DVD movies, including: customize disc menu, template, background music and background image of your choice! Excellent offline movie experience of online videos! With a built-in online video downloader, Video Converter Ultimate helps movie fans easily download videos from almost all video sharing sites, including: YouTube, dailymotion.com, metacafe.com, blip.tv, veoh.com, liveleak.com, videobash.com, funnyordie.com, aol.com, break.com, vevo.com, etc. In addition to its onloine video download capability, this media converter suite gets an online video accelerator and a built-in flash video player. Together, these two tools of this easy media converter software could accelerate the online video loading and play online videos smoothly. Easily create 3D movies out of 2D sources! With a built-in 2D to 3D converter, Video Converter Ultimate easily helps you convert 2D video/DVD to 3D movies in 3D MKV, 3D MP4, 3D AVI, 3D WMV, etc. for various 3D TV and players or create 3D DVD movies out of 2D videos. Audio: AAC, AC3, AIFF, AMR, M4A, MP2, MP3, OGG, RA, AU, WAV, WMA, MKA, FLAC, etc. Video: WMV, ASF, AVI, RMVB, FLV, RM, MOV, QT, MP4, M4V, DV, 3GP, 3G2, DAT, MPG, MPEG, VOB, FLV, MKV, MTS, M2TS, F4V, etc.